JAKARTA—The combined death toll from a tsunami and volcanic eruptions in Indonesia climbed to 449, as aid workers shifted their focus to prevent outbreaks of disease among survivors of the twin disasters earlier this week. Assessment and aid crews were finally reaching many of the worst-hit villages on the Mentawai islands off the coast of Indonesian Sumatra, where a tsunami following a 7.7-magnitude earthquake Monday killed 413 people, with more than 300 others still missing. But they said there were still some areas where aid wasn't getting through because of shortages of boats or inadequate or damaged infrastructure, raising fears of possible outbreaks of malaria and other diseases. Another concern was that many parts of the island chain—a relatively sparsely populated area some 12 hours from Sumatra by boat—don't have well-stocked hospitals able to handle the crush of victims. Although the situation was starting to get "relatively under control" after days of confusion over the tsunami's impact, much aid was still needed, said Lucky Tjahjono, deputy head of Health Crisis Management at Indonesia's Health Ministry, after a visit to the islands. He said displaced people were spread out across many locations, making it difficult to bring care to all of them. He said the government was deploying 100 doctors, nurses and medical staff and was expecting more volunteer crews to arrive soon. On Indonesia's more heavily populated Java island, meanwhile, the volatile Mt. 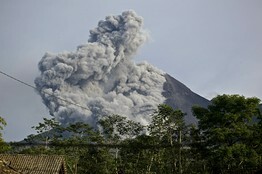 Merapi volcano rumbled with small eruptions throughout the day Friday, although there were no immediate reports of deaths, after 36 people were killed following a larger eruption on Tuesday. Experts said they were hopeful the series of smaller eruptions would help ease pressure built up inside the volcano without further loss of life, though they couldn't rule out the possibility of another major blast. Further away from the volcano, fears were rising that diseases could appear in impromptu refugee camps, where scores of evacuees are taking temporary shelter, unsure of when they can return. The head of health-crisis management at Indonesia's Health Ministry, Mujiharto, who like many Indonesians goes by only one name, said relief workers were especially concerned about respiratory problems, among other issues, as residents dealt with all the ash. Yeye Edwina, a spokesman for international aid group World Vision, said children were sleeping on tin mats, concrete, or cold grass, raising the risk of flu and fevers. Long queues of people lined up for toilets. Officials were shipping out 65,000 masks for residents to use to cover their mouths from ash, and were building toilets and garbage bins to help prevent the spread of disease. On the positive side, officials said the more-central location of Mt. Merapi compared with the Mentawai islands, and the better infrastructure, make it easier to manage the disaster response.